I'm sorry you feel the law and the official road marking guidelines don't make sense. Write your congressman. In the meantime, do you think you can dispense with the threadshit? It's not the law. Hence the problem. It is engineer discretion. Right. Boston has both this and this. I love the new separated bike lanes through the Casey Arborway project, but I think they really screwed up the transitions at the intersections. Instead of keeping peds and bikes separate with clear crossing points, they just kind of threw up their hands and put in these weird mixing zones. But they kept the ped and bike crossings separate as I would expect. It's just bizarre. RE Casey mixing zones: MassDOT decided to meet partway between a protected intersection like arrangement (advocated by BCU) and the mixing zones as done in the remainder of the SWCP path. It's awkward, but by and large its setup to slow cyclists down where people on foot and bikes meet. The mixing zones along the SWC don't force pedestrians and cyclists to cross over each other's paths at every intersection. On the new Arborway, you have the bike lane along the roadway and then the sidewalk outside of that. At the intersections, they force the two routes to weave so that the pedestrian route is closest to the roadway and then on the other side they switch back. It's unclear why they decided to introduce additional conflict points. 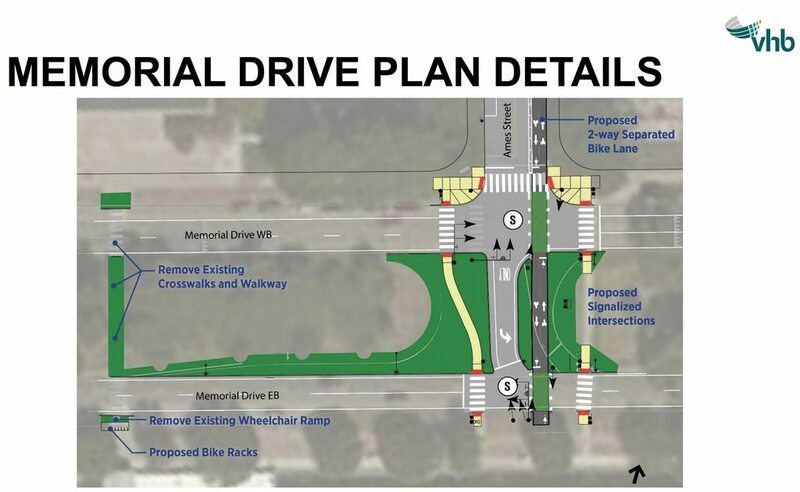 The shortest and most convenient route is for both pedestrians and cyclists to just go straight and use the wrong ramps and crossings and that's actually what they're doing. Interesting -- I haven't ridden on the Morton St. section yet, so I can't really comment on the configuration there, but most of the sections I have ridden do have the pedestrian path between the street and the bike path. That is the configuration approaching the South/Washington/Arborway intersection, for example. And at all four corners everybody does just go straight without crossing anybody else's path (unless turning). Crossposted from the Development forum, Kenmore Square redesign. Big improvements with curb separated bike lanes on the west side of Kenmore Sq. while only done within the general area of the new development, it demonstrates how to fix the rest of the square to make biking safe, convenient and far less stressful than today. Henry (or anyone) - were you at the path meeting for the roslindale bike path last night? I couldn’t make it. No, I had intended to go, but other things got in the way. I've heard generally that it went well, but don't have much in the way of details. Those signs are confusing, but correct. You can only turn right onto Memorial WB. Once you cross over Memorial WB, you reach another stop sign and then may process to turn left onto Memorial EB. The no left turn sign is referring to WB. The left was allowed when Ames St was one way here, but it no longer aligns properly to allow it. I have to say, I think having bike lanes in the middle of the street like at North Station is dumb. I never see people actually utilizing those bike lanes. It's mainly used as an island for North Station jaywalkers. My main issue there is how poorly it connects to the rest of the North End cycle track. For one thing, instead of continuing the track through Keany Sq, they have you bike behind the skating rink around the tennis courts and under the bridge (with poor signage). Then you have to bike over the rattly boardwalk at Lovejoy, and back over to Causeway street. Then you're basically on the sidewalk with no separation right in front of North Station where people were massing to cross the street before the tunnel opened. Only then can you get on the center cycle track. If the center track went all the way to Keany Sq it would work a lot better, even if you had to awkwardly transfer into it. My main issue there is how poorly it connects to the rest of the North End cycle track. Agreed. Even better, if it continued down Causeway/Commercial to Charter St, connecting to the cycle track there, you'd have a coherent "Connect Historic Boston" trail that's actually usable. Even with the tunnel open, there are still lots of people who walk from North Station to downtown office buildings. Having a bike path on the sidewalk without any curb separation is ludicrous. Bikers would be better off in the street. To be like Amsterdam or Copenhagen, it should be Sidewalk - curb - Bike Lane - curb - Traffic. The transfer to a center cycle lane also disrupts the flow. They had a clean sheet design with this road, what the heck were they thinking? I've used these, and I'm not a frequent biker. I actually like the central lanes when construction vehicles are not blocking them. It's getting into them that gets hairy (especially from the Merrimac/Staniford/Lomasney clusterf*ck). I agree with Stevebikes about how awkward it is between Causeway and where the track begins by the skating rink. I would also argue that the most useless section of track is the small segment in front of Portal Park - not only is it annoyingly short, but it functions as basically an extended sidewalk for anyone walking from North Station to Lovejoy Wharf and beyond. You can't ride there without dodging pedestrians.